Back-to-school usually means new backpacks and highlighters — but for some Pittsburgh students, it also means armed security officers walking the hallways. At the Woodland Hills Junior Senior High School in Churchill and the Rankin Promise School in Rankin, armed “school resource officers” are employed to help protect students from the threat of external violence. Churchill and Rankin police departments supply the officers, who have the right to arrest students in school. The officers will wear polo shirts and khakis this year instead of uniforms and will be armed with handguns but not tasers, as per the agreement approved on Aug. 23 between the school board and the police departments. School resource officers who are armed to protect a school from outside threats should have as little contact with students as possible. Officers who deal with student misconduct become less efficient in their responsibility of addressing dangers outside the school and disturb the learning environment by conjuring fear in students. The change in uniform does little to overshadow the history of abuse by resource officers toward students at Woodland Hills. Last year a 14-year-old student accused a resource officer of punching him in the face and knocking his teeth out. Videos from 2009 and 2015 show officers slamming students to the ground and tasing students. These actions prompted five students to file a federal class-action civil rights lawsuit in 2017 against the school, which details both verbal and physical abuse toward five African-American students, some with special needs. 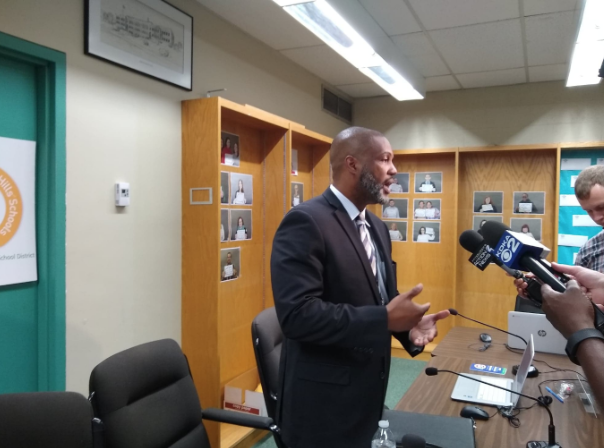 The school recently announced it will work to change the disciplinary process and newly hired Superintendent James Harris says “the high school discipline will be handled by the administrative staff at the high school, and not handed over to the police.” This is an important separation to make but still ignores the problem a police presence in school hallways poses. To create a safe environment free of brutality, there needs to be an enforced divide between students and school resource officers. Rather than consider them connected to students or responsible for discipline, it would be better to call them security officers and set their main function as external security. Removing them from the hallways and posting them in central offices or toward building entrances and exits vulnerable to external threats removes unnecessary contact between students and weapons. Maintaining a clear boundary also means staff should not be allowed to request intervention by officers in cases that are not immediate safety risks or serious crimes. Likewise, officers should refuse to involve themselves in situations that should be treated as matters of administrative discipline. Officers stationed in schools should also undergo training in adolescent psychology to better prepare them to deal with situations unique to a potentially unfamiliar school environment. According to a 2013 report by Strategies for Youth, an organization that aims to improve interactions between police and young people, “youth feel officers do not hear them, routinely ignore their point of view and proceed on the assumption that every youth encountered is guilty.” Simple training could help officers understand and maintain appropriate contact with students. Woodland Hills has a responsibility to its students to prevent further incidents of brutality against them while ensuring their safety from outside threats. Woodland Hills, and other schools around the country that employ student resource officers, would do well to enforce definitive boundaries and offer adequate youth training to work toward this end.